I set Stay Well Soon in a fictional hospital in Melbourne. Stevie spends a lot of time at the hospital visiting her brother, and she isn’t very happy about being there. In my first drafts of the book, the hospital was a pretty depressing place to be, with long grey corridors and lame toys in the boring Kidz Space. It was based on my memories of visiting my sister in hospital when I was a kid. Then I visited the Royal Children’s Hospital in Melbourne for an appointment with my baby son. 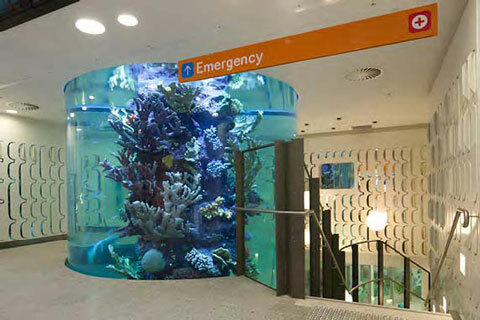 It completely changed my view of what a hospital could be like. It is amazing. There is a meerkat enclosure and a two-floor aquarium with a shark, and massive screens to play games on. It is not aesthetically depressing or lame at all. Our trip to the hospital was unexpectedly enjoyable. So I rewrote the description of the hospital. It’s still a fictional hospital, but it’s a more impressive, modern and fun hospital. Of course, Stevie still doesn’t want to be there, but since she has to be, it’s nice that there is some interesting stuff to interact with.